. . .Chesterton Takes Sides in Trolley Strike.' This was inaccurate. When I spoke I not only did not know that there was any trolley strike,[Pg 59] but I did not know what a trolley strike was. I should have had an indistinct idea that a large number of citizens earned their living by carrying things about in wheel-barrows, and that they had desisted from the beneficent activities. Any one who did not happen to be a journalist, or know a little about journalism, American and English, would have supposed that the same man who wrote the article had suddenly gone mad and written the title. But I know that we have here to deal with two different types of journalists; and the man who writes the headlines I will not dare to describe; for I have not seen him except in dreams. This is the third time I've read this book, and each time I read it I catch something new. 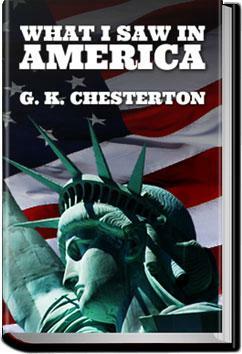 Published in 1922, "What I Saw in America" is a collection of thoughts about America by the brilliant British writer, G.K. Chesterton. It was his only visit to America, during a lecture tour. What I Saw In America was a delight, certainly the best and most interesting book I've read this year so far. Highly recommended--if you read any Chesterton, you must read this book.